Coney Island, April, 2011. The expansive and uncluttered beach of Coney Island, New York stretches for nearly 4 miles from West 37th Street, Sea Gate through central Coney Island area, Brighton and Manhattan Beach. It is the first day of the official summer season and a handful of swimmers are braving the cool waters and the mid-afternoon sun, boisterous kids building sand castles, playing basketball or beach ball, running amok on the hard sand or trying to fly with the kites. It is same beach where the American poet Walt Whitman liked to ‘…. race up and down the hard sand, and declaim Homer or Shakespeare to the surf and seagulls by the hour.””(Michael Immerso ). 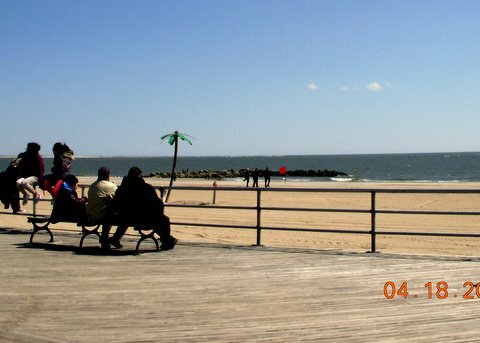 By late afternoon the footfalls on the Riegelmann Boardwalk increase with families, singles and seniors making a beeline for their favored activity. The generation gap is visible with older men and women squatting on benches and staring vacantly into space, reminiscing of the days when celebrities strolled the Boardwalk and the Island was considered the best place to be in by the New Yorkers. In the 1800s the beach was not as crowded, and the leisure seekers, artists, poets, writers and the reclusive rumbled across in carriages and steamboats from different parts of the city to soak in the relative quietude of this Atlantic Ocean peninsula in southern Brooklyn. 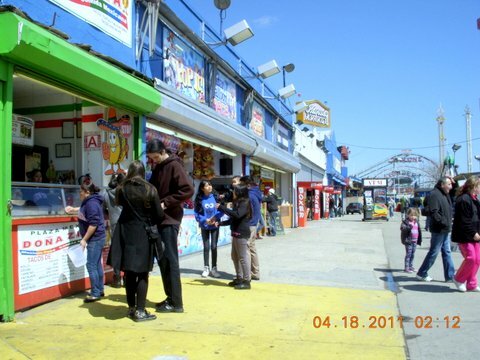 The Boardwalk was the link connecting Coney Island’s amusements parks with Brighton beach, Manhattan Beach and West Brighton. I looked around visualizing rabbits instead of people because in 1609 the Island was a marshland with rabbits roaming freely. Henry Hudson and the Dutch East India Company came looking for spices and finding rabbits on this open grazing land named it “Conyne Eylandt” from the Dutch word for rabbits. In 1643 the Island was sold to an English Mennonite but it was only in 1824 with construction of a toll causeway that it was accessible to New Yorkers. Soon a ferry pier and pavilions were constructed for convenience of day visitors, while the rich and famous, including Walt Whitman, Herman Melville, Washington Irving, Edgar Allan Poe, Daniel Webster, flocked to the Island’s inns and hotels. The mystique of Coney Island slowly lost out to the American Civil War and introduction of railroads and steamships that lessened travel time to two hours. It was no longer the exclusive holiday spot but more of an escape from the stifling heat of New York summers. The Island saw a continuous flow of holiday makers out to enjoy the newly opened Aquarium, race tracks, theaters, beer gardens, gambling and concert salons – and bringing with them the related crime and undesirable elements. The beach was no longer Whitman’s “long bare unfrequented shore” making the poet look to other places for holidaying while the moneyed and the famous flocked to the self-contained hotels with their own rail line or steamship connections and mansions in the East end of the Island. The rest of the junta congregated at Coney Island or Brighton beach Boardwalk and its environs. 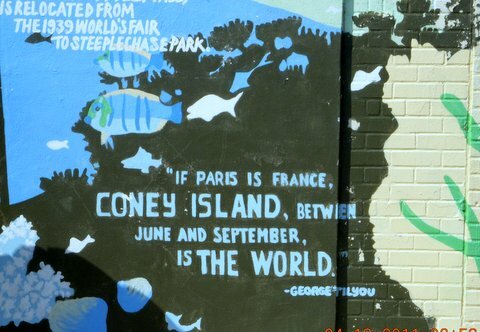 I walked along the Boardwalk towards Brighton beach reading the graffiti on the wall, one stands out in my memory, referring to Coney Island as “the world”. The surroundings resonate with the past of world-class hotels, the quirky attractions, such as the Elephant Hotel now painted white, the Mermaid Parade, Nathan’s Famous ‘hot dog’* eating contest and the bars on Russian street. 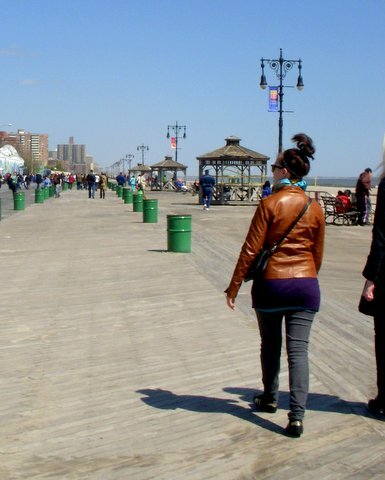 In Darren Aronofsky’s movie, REQUIEM FOR A DREAM (2000)*, centered on the Russian quarter in Brighton, the son drags his mother’s television along the Boardwalk towards Coney Island. I was trying to retrace the steps but then realized I was walking from opposite direction, from Coney Island side, along Nathan Avenue with its landmark Nathan’s Famous hot dog place. 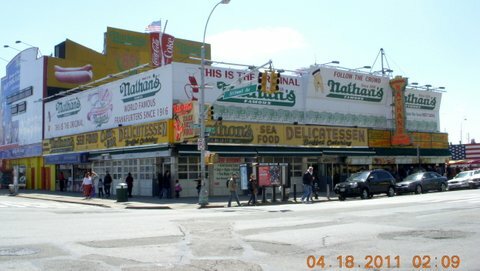 Nathan’s had opened in 1918 and hosts the annual Fourth of July Hot Dog Eating Contest. The story is that the contest started as a wager between immigrants to confirm their American-ness by eating as many hot dogs as possible, and since then it has become an annual feature attracting the Fourth of July holiday crowd to the Island. 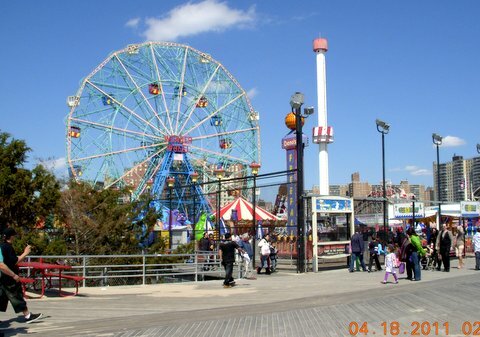 Another odd and quintessential part of Coney Island’s history is the yearly Mermaid Parade held on Surf Avenue and the Boardwalk featuring floats and various ocean-themed acts, and is the Island’s homage to the Mardi Gras parades of the early twentieth century. The unconventional ambience of the Boardwalk with its multifarious stalls laden with porcelain dolls, Chinese gift items, sequined beach slippers, candy floss and general items highlight the ethnic diversity of people. They come in various sizes and sensibilities; a Russian matron in body hugging garment swaying along with her pony tail, youngsters in different stages of undress and in contrast to a fully covered Middle Eastern Begum with her family oblivious of her surroundings, harassed parents buying pink candy floss for their squealing kids and boisterous groups in the cafes enjoying their lager, hot dogs or Donar kebabs. The sea smell mingles with the smells of world cuisine from Russian, kosher, Middle Eastern, German, Japanese, Chinese and Indian. A few enterprising families and youngsters make their way to the amusement parks, past the shooting stalls and smaller rides with their owners trying their best to attract visitors. In April 2011 new roller coaster rides were added, the first since 1927, but not being inclined towards roller coasters I did not venture in that direction and preferred the benches to escape the afternoon sun. E.E.Cummings writes about the chaotic diversity of Coney Island referring to the ‘trillion smells; ….the metamorphosis of atmosphere into a stupendous pattern of electric colors, punctuated by a continuous whisking of leaning and cleaving ship-like shapes… (Brooks McNamara). Coney Island and Brighton Beach were home to Jewish migrants from Eastern Europe and Russia and gradually over time saw an influx of African-Americans, Italians, Hispanics, Asians and the recent ethnic group the Russians and Ukrainians living in public and multi-storey houses. One can see construction all around with townhouses, towers and shopping centers coming up in between gaps. The private gated community of Sea Gate cordoned off by a fence as compared with ‘public’ Brighton and Coney Island. 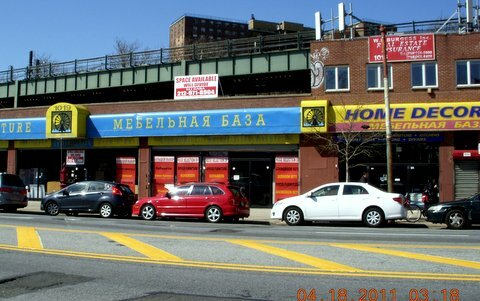 One can spend an entire day walking around this aging beach resort admiring the mish-mash of cultures and constructions, the Russian signage on furniture shops and pubs and the swanky new station, the Coney Island – Stillwell Avenue, the biggest elevated metro station in North America. 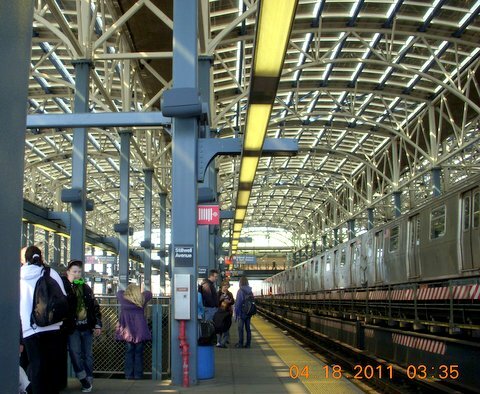 A large solar panel canopy covers the eight tracks serving the D F N Q trains from New York City subway. When we had alighted at the same station around eleven-thirty a.m. there were only a handful of holiday-makers but on the return journey, around six in the evening the carriages were full. The reason being that with a diverse population and the residue of the 1950’s New York Street gangs still visible, (there was a shoot out on the Boardwalk as recent as June 2011) the evenings are for the brave of heart. It was an afternoon well spent romancing the dowager, primed and preening and waving the magic wand for the trains and ferries to roll in the revelers. We had gone on the first day of official summer season and it was not so noisy as other beaches. The history of the place is more significant than the present. Well thought out and very nice description of a place that brought back many memories for me. Thanks for posting.